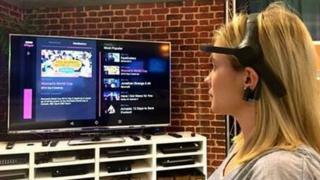 If you think controlling your TV with your mind is the stuff of science fiction, think again. The BBC, in collaboration with tech company This Place, has developed a way people can select programmes using a cheap, brainwave-reading headset. The headset works with an experimental version of the BBC's iPlayer on-demand platform. Users can turn on and operate the app by concentrating or relaxing their minds. "It's an internal prototype designed to give our programme makers, technologists and other users an idea of how this technology might be used in future," said Cyrus Saihan, head of business development for the BBC's Digital division. In the first trial, 10 BBC staff tried out the app and were able to launch iPlayer and start viewing a programme via the headset, he said. "It was much easier for some than it was for others, but they all managed to get it to work," said Mr Saihan. This type of technology could be used to help people with a broad range of disabilities who cannot use traditional TV remote controls very easily, Mr Saihan believes. Manipulating electronic devices using brainwaves is becoming more widespread. For example, in February technology firm Tekever demonstrated how a drone could be remotely controlled using brainpower alone. The pilot controlled the aircraft wearing a skullcap embedded with electronic sensors that could read his brain activity. You can watch a video about the iPlayer mind control project here.